Oh look, another postcard. It's a cheesy, yet thoughtful way to share your global adventure with your friends or family. I don't see them that often anymore, but they are fun to receive, aren't they? There's always a friend or relative out there, exploring the globe and discovering new places. These postcards are a window into their world, but they don't truly capture it. The picture rarely gives a personal vision of their adventure. It's one thing to read their stories and imagine. It's another thing to see it. Perhaps you want to follow in their foot steps. Perhaps you want to strike out on your own voyage. Whether it be across the ocean or across town, why not blaze a trail for everyone to see? Though it's been out for a while, I turned to GPSed to mark my path. GPSed helps you record and archive your potentially world spanning treks with your BlackBerry smartphone. Along the way, you can capture and share images you've taken to enhance your tales of travel (I told you the fish was that big!). You'll spend less time picking and filling out postcards and more time making tracks. Is GPSed your next travel companion? Read on to decide. SHAPE Services is the company behind the GPSed solution. You may recognize other applications brought to you by SHAPE services including; IM+ All-in-one Messenger, DeskFinder and Mobiola Screen Capture. The current build, version 2.0.0, is available for BlackBerrys running 4.3 or higher. There is support for OS 4.2, but you have to head to the GPSed site. If your BlackBerry doesn't have an internal GPS receiver, you could utilize an external one. GPSed actually comes in a free and a PRO version, which we will take a look at both. Each of these versions will occupy approximately 462KB. With this application, you can create and manage what GPSed calls "tracks". With each track, you can capture a great amount of information. I would count each trip (point A to point B) as a track. Of course each trip may have a stop or seven on the way. You can make note of every souvenir shop, bathroom break or greasy (but ooooh so yummy) diner your stumble upon. Yes folks, each of these memorable moments can be recorded as a waypoint. Keep in mind that waypoints can only be added while a track is being actively recorded. GPSed sports multiple screens to handle all of this information. At the top of each screen, you can see your current time, battery meter, satellite state and wireless signal strength. Your trackball is used to scroll through all of the screens. You may have to adjust the trackball sensitivity or you may skip the screen you want. Fortunately, each of these screens come with a name, so I will explain what can be found on each. Above is actually the Main screen. 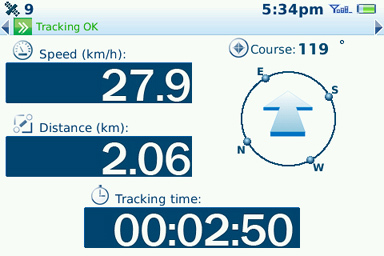 Here you can view your heading via compass, your velocity, distance traveled and elapsed tracking time. The unit of measurement can be changed from metric to imperial to nautical. Its accuracy is slightly questionable. Even as I write this review, my velocity jumps from 0.0 km/h to 0.9 km/h. Perhaps I should get a desk chair without wheels. 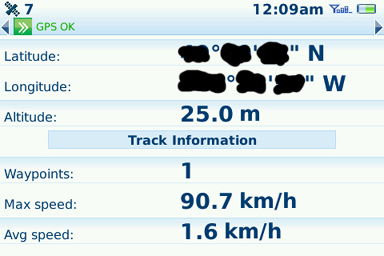 And even when I was at a stop for a minute or so in my car, my velocity still read (on average) 1.5 km/h. This is the Track Info screen. At this screen, I can see my location and track information. So at the top, my latitude and longitude and altitude are seen. The bottom displays the number of waypoints for the current track, your max speed and average speed. Here is the Track Preview screen. 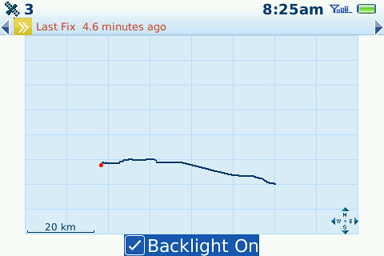 This screen will display a basic mapping of your route - the red dot indicates your current position. There's not much functionality here, just a live, graphical representation of your path. I was impressed that GPSed was able to get this screen to auto-zoom while recording. The track detail screen lists file properties for the current track. As with previous screens, distance, elapsed time and average/max speeds are detailed. You will also see how many photos were captured, the file path and the time created. The Photo List will house all images that you have captured on your journey, which are viewed as thumbnails. From this screen, you can upload photos to your online account, or delete the image from the track or memory (n-no honey, I didn't go to ANY bars on the way…). The track list page is where you manage all of your tracks. The track can be saved to your micro SD card or device memory. When you are at this screen, your options include; uploading to GPSed.com (your account), converting the file to GPX format, viewing track properties, view the list of photos associated and upload photos. 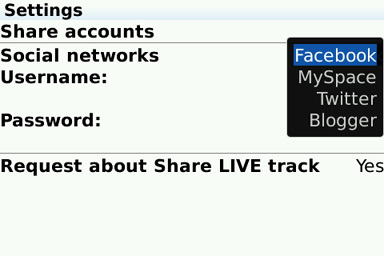 To enhance your experience, you add support for your social network accounts. In other words, you can upload your photos to the following; Facebook, MySpace, Twitter and Blogger. You can also indicate whether you are walking, or driving in the city/ on the highway. Now say during your travels, you happen to get lost. 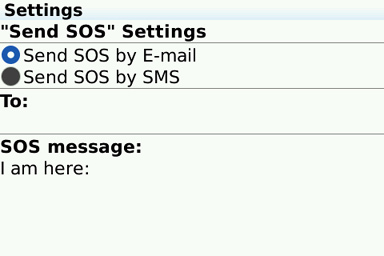 The GPSed application has a "Send SOS" option that will help you send out an email or SMS to pre-determined contacts. They will receive your general co-ordinates. hmm..who wants to know where I am? If you head over to GPSed.com on your computer, you can view your uploaded tracks. The site also lets you view larger images, waypoints, or utilize google maps. I bet that beats boring evenings of slideshows! New! Photo attaching and management directly in the mobile application. SOS button for instant position alerts over SMS or e-mail. Wherever you are you can instantly notify your friends or relatives about your current position via SMS or e-mail. They will receive a link to the page with your position on a map. Live tracking with small time intervals up to 3 seconds. If you want to share your real-time position this feature is for you. GPSed Pro can work over TCP/IP, that allows to update your position during tracking really often and minimize mobile traffic consumptions. Now before you go out on an adventure, make sure your BlackBerry is well protected. I'm not taking responsibility for your need for thrill seeking while using GPSed.